#Golfchats happen every Tuesday at 5 pm and Wednesday at 9 am PST on Twitter. Hope you can make it! When I left my job as a high school History teacher and started my tutoring business, I began participating in Twitter chats on eduction, the biggest being #Edchat. #Edchat members got together once a week to discuss education. A series of questions were posed throughout the hour. Members tweeted, retweeted, shared and discussed. The 140 character limit on Twitter really helps to cement and solidify your ideas on a topic and I began to learn – a lot. I can honestly say that in the three months I participated in #EdChat, I learned more about education than I did in my four years of college, my year in the credential program, and my four years in the classroom combined. Step #1: Get a Twitter account. To participate in #GolfChat, you’ll need to have a Twitter account. Setting up a Twitter account is easy: visit www.Twitter.com and sign up. Step #2: Log in every week. To start, #GolfChat will be every Tuesday at 5 pm and Wednesday at 9 am PST. The Wednesday version is a repeat of the first session for those who have schedule conflicts. 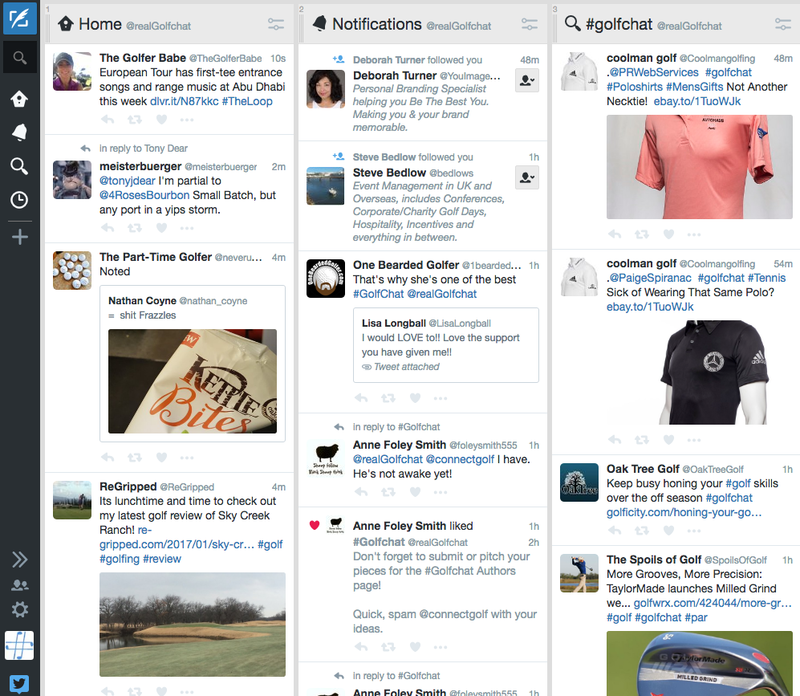 Step #3: Search for #GolfChat in the Twitter search bar. This will show you all tweets that have used the #GolfChat hashtag. Reply, retweet or mention anything you want. Step #4: Use Twitter tools to help you navigate the discussion. My favorite tool to use to keep up with the chat is TweetDeck. In one column, I can keep track of my regular feed; in another, I get notified whenever someone mentions me; and in the last, I see whenever anyone uses the #Golfchat hashtag. Each week we will pose questions asked by our community and we’ll discuss and debate those topics. Each question will take 7-10 minutes depending on the number of questions submitted that week. Find out what we’re going to talk about each week by checking out the questions or signing up for the weekly newsletter. Do you have questions about #Golfchat? Run into any trouble? What topics would you like to cover? Looking forward to chatting with you all in #Golfchat! Posted in #Golfchat, Twitter #Golfchat. #golfchat question…”What was the most fun/or strangest par 3 you have ever played?” Why?